We often think of the digital age as being dominated by technology. Social networking, online marketing, email and the Internet itself all depend on complex systems running all day, every day. What’s overlooked when we focus on all of those flashing lights and zooming bits is the silent partner in all of this technology — the written word. Never has effective writing been important for businesses. Your workers must be prepared to produce and deliver well-written communications to the public, their coworkers and their clients. You know it’s important, but how can you know what it’s worth? The Effective Writing ROI calculator makes determining the financial benefits of professional training for your staff fast and easy. Some people do have a talent for writing, but even they may not be effective business communicators. Your business doesn’t need someone that can describe a sunset with perfect prose. Business writing needs to be effective and straightforward. Effective writing doesn’t require a well of “natural” talent, but it does benefit from professional instruction. Training costs money, but the Effective Writing ROI Calculator helps you weigh the cost of training against the cost of bad writing. The time and effort required to revise bad writing is money wasted. 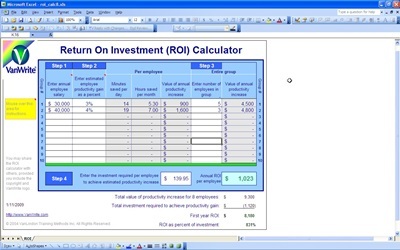 The Effective Writing ROI Calculator allows you to forecast savings derived from even modest investments in communications training. Improving writing skills in your organization increases profits by increasing efficiency. Manufacturers have known for decades that the key to profitability is keeping production costs down. This same is true for business that produce documents instead of cars. Lowering the cost per document, email, blog post, review, memo, manual, or proposal reduces the cost of running your business many times over.